The Samsung Note II's main camera can capture stills of up to 3264 x 2448 pixels and 1080p videos, while the one on the front snaps 1.9MP pictures and 720p video. The camera app offers geotagging, touch focus, HDR mode, burst shot (with Best photo), Share shot, face and smile detection and digital image stabilization. Thanks to the fast quad-core processor, it can also simultaneously record HD (1080p or 720p) video and take near full-resolution pictures (those are cropped to an aspect ratio of 16:9 to match that of the videos and what's seen in the viewfinder). Samsung Galaxy Note II also has a feature called Best faces - it snaps a burst of 5 photos, keeping track of people's faces. Later, you can pick any of the 5 photos for each person's face individually. 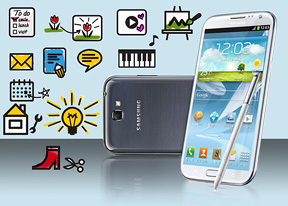 The Samsung Galaxy Note II offers other cool features for after you've snapped the photo. It can automatically detect faces and if you link those to people in your contact list, it will be able to recognize them from then on. Each face tagged in a photo has a little speech bubble next to it with the person's name, which you can tap to get a popup menu with options to call, text or email that person (Buddy Photo Share works here too). Cooler still are the "contextual tags". When you turn them on, each photo will be labeled with the location, people in the photo (automatically recognized) and date. This is non-distracting and you can always switch it off. You can also add hand-written notes on each photo (also non-distracting). You can also snap a photo of a document and use the Get text option to OCR the document and convert it into regular text, ready to be copied and pasted anywhere you want. The video camera uses an identical user interface. It can apply various effects to the video and there are slow-motion (1/2x) and fast motion (2x) modes. Touch focus during recording is available, with an AF button to switch back to regular continuous autofocus.